Sequences, or patterns, of objects or shapes are a simple, fun task that can be done on paper or with physical items kids can manipulate. If you create a context for pattern games, they are also an opportunity to use verbs and vocabulary in sentences and in situations that make sense. Of course, just talking about a pattern and what comes next can also be an effective way to work with vocabulary and introduce language used to talk about sequences. For sequence vocabulary and lots of ideas of different pattern games for Spanish learners read Spanish Vocabulary with Pattern Activities. Adding context to pattern games basically means adding a question asking about what is missing from a sequence. The context for the question does not have to be complicated. A very simple question is enough to let kids hear a verb that they can then use in the answer. You can see how simple a question can be in this example from a set of pattern games I made. Introducing the dinosaur lets you include the verb comió. You can download a printable activity sheet with patterns like this below. Of course, the best way to create context is with real situations. It is fun to ask questions about sequences you make with objects. You can make a pattern, for example using plates, cups and spoons. A student can hide one item in the pattern behind her back and you can ask ¿Qué esconde Olivia? Kids can make their own patterns, too. You can download two versions of the printable pattern activity. The first is to be used orally, or students who have more Spanish can write answers on a separate paper. The second version has sentences to complete. Download pattern games with questions. 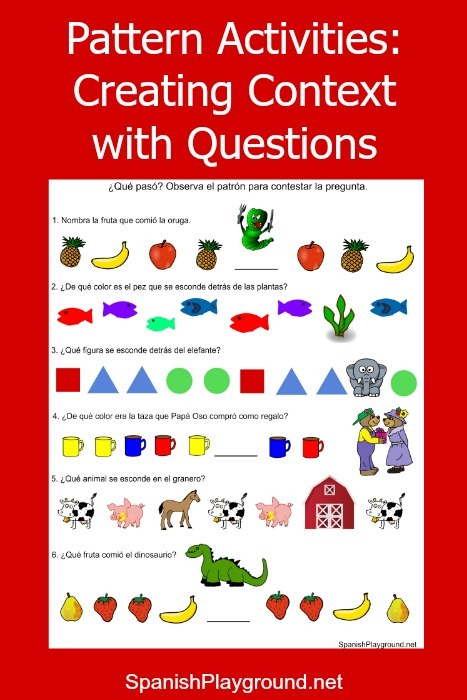 Download pattern games with questions and fill in the blank answers.